Quite often, I find a piece of information via a newsletter or on the Internet that I want to keep. My normal routine is to select the text/graphic that I want, press Control>C, open a new Document, and press Control>V. Depending on the source of the text/graphic, I will get exactly what I want -- a nice clean paste of ONLY text and/or graphic. However, when copying and pasting from some websites and/or newsletters (yours included), I get the text and graphics, but all of the text is 'underscored' and I can't get rid of the underscores. If I select 'Paste Special' and save as .rtf, I will get text without underscore but no graphic. What's with this and how can I avoid the underscores? I was able to reproduce something that sounds like what you're seeing. I'm not sure that it's exactly the same, but I'll describe what I think is happening (hint #1: it shouldn't) and what you can do. And Hint #2? They might look like underlines, but they're not. Here, I've selected the summary line through the text at the bottom of this screen capture. Ctrl+C copies that to the clipboard. In Microsoft Word, I type Ctrl+V to paste what I just copied into a new empty document. And sure enough, some of the text appears underlined. Except ... those aren't underlines. The clue that makes me think that revision marks are the problem is that the underlining is continuous and there's a revision mark bar down the left-hand side. I didn't have revision marks enabled. Even if I had, I'd expect that all of the text would be treated the same way. Revision marks, when enabled, are intended to indicate what text has changed in an existing document. Changed words are typically colored differently and underlined and the revision mark bar is placed along the outer edge of the page at the position which the changes occurred. As I said, when enabled - which they are not. The best way to remove revisions is to tell Word to "accept" all of the revisions. Click the Review tab in the Word ribbon, then click the Accept button, and finally choose Accept all Changes in Document. The unexpected underlining is gone. To be honest, I believe that there's a bug in here somewhere. One clue is exactly where the underlining started. When I look at the page from which I originally copied the code, an advertisement sits in between the text that is not underlined and the text that follows, which is underlined. Even though it was not highlighted in the copy operation that I started with, it was included. I believe something in the material copied erroneously caused Word to turn on revision marks when it was pasted in due to that advertisement, even though the revision mark indicator still showed that they were off. Even though accepting all changes is a pretty simple solution, my theory is that when you select part of a web page to be copied, avoid advertising blocks. A couple of tests here seem to bear that theory out. How do I turn off automatic formatting in Microsoft Word? Microsoft Word tries to be helpful and format items based on what it thinks you're doing. That's handy, if it's what you want. If not, it's annoying. How do I overline characters in Word? It is actually very possible to overline characters in Microsoft Word. Why does Word tell me a document has changed when it hasn't? It's sometimes hard to tell why Word thinks a document has changed even though you haven't done anything. We'll provide a few clues. Why not just use 'paste special' command from the ribbon? Use paste special (which appears as a drop down menu item below paste button in word 2007 or under edit tab in 2003) and select paste as unformatted text or unformatted unicode text. It will be pasted as plain text. Useful in many other contexts as well. I often copy from web sites (most often my email) to a document, and although I've not had this problem, I find my style sheets get cluttered up with whatever was used for the website. Messy and undesirable. I paste into notepad (which reduces the formatted text to pure text) and then copy and paste into my document. This might also help avoid the underlining. I did a bit of testing after reading your article, and found that the problem does not exist when using Oracle's Open Office, a suite I greatly prefer over Microsoft Office. 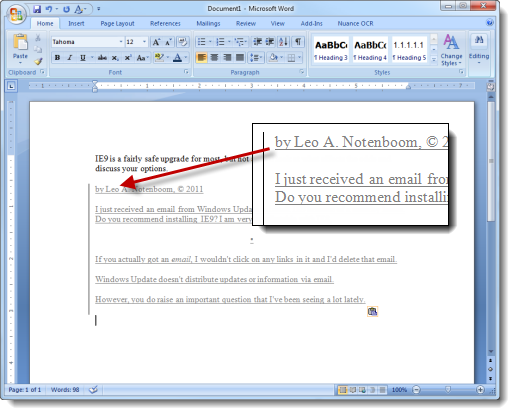 The revision marks don't show up in a Word doc on my system when I do what Leo did, but I'm running Word 2007 under Windows XP Professional, version 5.1 (with SP3). I always use Paste Special, Unformatted Text when pasting from a web page into Word. In fact, I have placed the Past Special tool on the Quick Access Tool Bar. I have had this same issue and am using Word 2002. The underlining did not show up until the document was saved and opened in a browser window. What was happening in my case, was that for some reason, Word had decided to make hyperlinks out of, sometimes, practically every other word on the page, that should not be there. 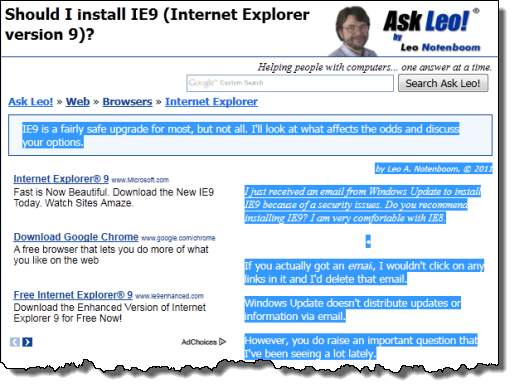 When the text was moused over, the pop-up appeared showing there were hyperlinks all through. The only thing that worked was to right click each one and choose "remove hyperlink." Appears there is no way to select blocks of text and remove all at once. 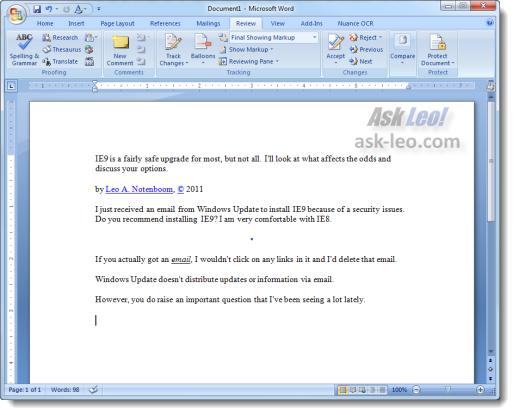 You can copy the document into WordPad or Notepad but will lose all of your hyperlinks, and most other formatting. 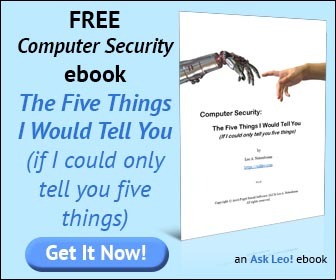 As Leo says, avoid including advertising when you are copying from the webpage. Also avoid copying any large splashy headers, tables, special formatting, images, etc., especially if they contain links, and most do. A lot of times, these can be copied and pasted, but perform this separately from working with the text for best results. Bottom line, copy and paste part by part, and be careful with anything that isn't just plain text. If there is a choice to "print page" use that option as it works much better in copying and pasting into Word. I use Wordpad for this mainly because of it's limitations. It all depends on how the web page was made. There could be protections to prevent "lazy" people from easily copying someone else's hard work. I am a programmer but not a web designer and barely understand the process. In some cases, when pasted, the words have been single-line. It's a time "cost/benefit" issue. How much cleanup will I have to do.? Or when selecting print preview, the body of the page isn't even there. Are these difficulties designed in? My girlfriend complains about the ads when opening some YouTube videos or slowdowns on skankbook applications. *doesn't shut her up, tho. Paste special/unformatted is very useful, but sometimes too drastic. One of the types of formatting which I find bothersome is the way in which copied web-pages often show up as big tables in Word. I recently discovered that these can be easily be turned into text with the "Convert table to text" command, shown in the Table menu in Word 2003. I use ClipMate from Thornsoft as my clipboard. It has a function that will strip out everything but text. Thanks Leo. I had the same problem but wrongly assumed the underlines were the result of copyright protection. Thanks Leo. I also experienced this but didn'nt have the foggiest notion of what was happening. One of the commenters mentioned that copying "bottoms up" works better -- I second that! For some unknown reason I almost always get cleaner results doing it bottoms up than top down. Phillip's post of June 21, 2011 10:01 AM explains the simplest of simplicity. Simply simple. Many times I run across various issues which are easily resolved by pasting to the clipboard, then copy and replace. Quite simple, eh?